INTRODUCTION: Everyone has a mom. And everyone knows just how hard moms work to give their children the love and attention they need to grow into successful adults. Is it possible to forget your mom? Not unless maybe you have Alzheimer's. Or, unless you are the spectator in this effect. 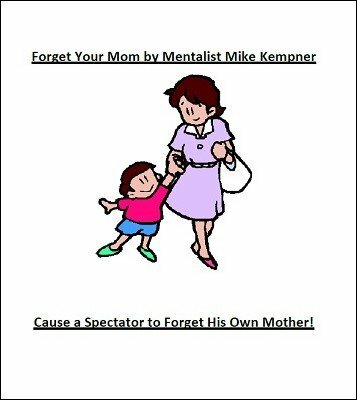 This is an application of an underutilized (and somewhat lost) principle that will cause a spectator to forget his own mom! EFFECT: Using a hypnosis premise, you tell the spectator a very simple story that involves his mother. Despite the fact you ask him to say the word "mom", he will be unable to do so. He will seem to have forgotten the very person that brought him into this world! 1st edition 2015, 2 pages.